THANK YOU VOTERS! PROP 1 PASSES! Voters residing in East Pierce Fire and Rescue narrowly approved an $80,000,000 Capital Bond Issue that will fund the construction of five fire stations and upgrade front line emergency vehicles. The measure required a super majority (60%) yes vote to be approved. The initial numbers posted the evening of the November 6th election were 17,211 votes with a 58.27% approval of combined votes from Pierce and King Counties. By the evening of November 26th, the ballot count had risen to 39,486 with a 60.27% approval rating. At last count, the measure passed by just over 100 votes. “It’s been a heck of ride,” stated Fire Chief Bud Backer. “To make up two percentage points from the original posting is an amazing feat. I can’t thank the voters enough for providing us with this opportunity. The District will move forward with the process of selling bonds by the end of December so that funds are available to begin work right away in 2019. THE BOARD OF FIRE COMMISSIONERS of East Pierce Fire & Rescue (“District”) adopted Resolution No. 841, concerning a proposition to finance fire stations, land, vehicles and equipment. 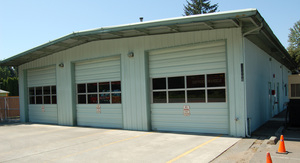 If approved, this proposition will authorize the District to: construct 4 new fire stations to replace existing fire stations; acquire land; construct a new fire station in Tehaleh; acquire firefighting and emergency medical service vehicles and equipment; make other capital improvements; issue no more than $80,000,000 of general obligation bonds maturing within 20 years; and levy annual excess property taxes to repay the bonds, all as provided in Resolution No. 841. The proposition will be included on the ballot for the November 6, 2018 General Election. How Will The Bond Help? The majority of East Pierce Fire and Rescue’s facilities are old, outdated, non-compliant and in dire need of updating or replacement. The extent of work requires a two-phase approach. A bond issue is the most cost effective and reasonable funding option to accomplish the work. * Leased station. Building owners want to regain possession. East Pierce Fire and Rescue has never before asked voters to approve a capital bond issue. PHASE TWO will require financing later.